What a day it has been! I may need a vacation after SL9B – I keep running around, not knowing what to see or hear or do first! 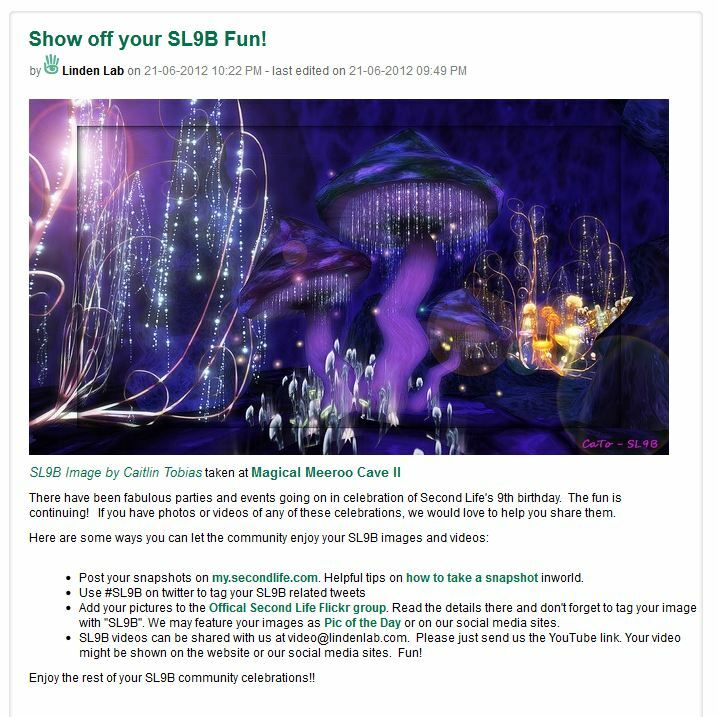 To start with the surprise of the day, LL used one of my pics of SL9B in their blog, making me feel all proud and honoured. They picked the Magical Meeroo Cave with shiny things, heh..I guess shiny things work for everyone? So, what did I do today? I visited two sims, that is about what I can handle to keep things fun. On Birthday Bash I ended up in an installation of the Noiser Community. They have a build with insects and well…some odd things happened…. After all th bug-stress I flew to Nine, where I found a wonderful lush forest, called: The Forest. Just what I needed to relax a bit and get myself together for some partying I had in mind. Refreshed and all fit again, I did the small hunt for the 10 Cake-Hats, created by Misaki Slade (who also created the huge Cake Stage) and went dancing on Partytime, where I spotted Argus being all gorgeous! I gots a Cake on my head!